How Much Competition is Healthy? Home > Sports > How Much Competition is Healthy? In this politically correct world of ours, we hear far too much about activities which have been curtailed for spurious reasons. One of these is the recurring story of the children who are banned from playing actual sports matches because it does not do them good to lose. One newspaper sports editor, having included a match report on under tens football, tells a story of how he received a letter from every child in the same class – evidently a class exercise – complete with note from teacher, asking if he could say ‘did not win’ rather than lose, because the children were upset at losing! But the reality of the matter is that children should be introduced to competition. If they are not introduced to competition at an early age, then when they compete against others later in life, be it for jobs, university places, you name it, they will find rejection very hard to take. An Americanism, Little League is phenomenally successful brand in which children aged between eight and 13 play baseball. The idea is to give them a competitive taste of what it will be like to play in a baseball league in high school and college. Far from making the children overly competitive, the league actually serves to give them a great feeling of self worth and make them into rounded adolescents as they grow up. Our junior football leagues here in the UK perform a similar function with children who take part in them having an idea of fair play and teamwork as well as competition. This is a phrase which has been coined to describe the offspring of the one child policy in China. They become children so used to having their own way that they are intolerable – partly because they are spoilt by parents and grandparents and partly because they have no-one to compete against. With no siblings or cousins, they have their own way all of the time, making them more spoilt and more unable to compromise. The problems with competition tend to come in when children’s parents get competitive on their behalf. This is when unreal expectations are put on their shoulders and it becomes a burden too much for them to take. It can also lead to aggression – both from the parents and the children, which is a sure sign that something has gone wrong and the children have become too competitive. Like all aspects of childhood, when it comes to competition, parents should use their discretion. If they think their child has ceased to see competition as fun, then they should stop them from competing for a while. But a life without competition at all is no preparation for life in general as an adult, because whether we see it or not, our daily lives are full of jostling for attention, competing for notice and other events which are, whether we term it such or not, competition. And that is why children should learn how to handle it gracefully from an early age. 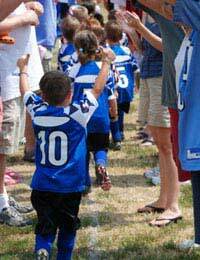 Uncoordinated Children: What Sport is Best for Them?